I flew down the stairs (yes, really flew) and hugged Satish and I started crying. I was so emotional. He had no clue what had happened. "My book is in the longlist, it is mentioned in the longlist," was all I could manage to utter.A few minutes later, I had calmed down and the the first thing I did was ask Ronald for his phone number which he immediately messaged me. I called him and thanked him. "Wow!! 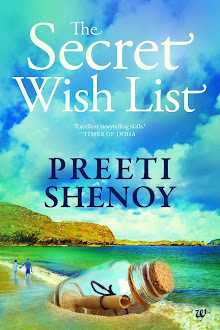 just got a call from the author of the best selling book@preetishenoy herself..thank u so much M'am. It means so much!! " To me, it seemed the most natural thing to do. I never even thought I had done a 'big thing' by calling him up and thanking him. The way I saw it, he was kind enough to care to inform me. He had read my book and had loved it and he was genuinely thrilled for me. For me, that was all that mattered. How much I wish my dad was alive to see this day. He would have been ecstatic and I can picture him proudly telling his friends about this achievement of mine. It would have meant a great great deal to him. The best was yet to come though.There was another surprise in store for me. A week back, the book made it to the best seller list on Flip-kart and yesterday, it made it to Number three position where it currently stands. The mails that I get praising the book have now increased threefold. I am so overwhelmed with the response this book is getting and I am humbled and moved by how much it touches people. A large number of people ask me if Ankita (the protagonist of the book) really exists. As is mentioned in the "Author's note" which appears at the end of the book, the answer to the question is 'Yes'. Real life Ankita indeed exists and her story is a true one. It was a story which I simply had to write, as it was a powerful and a deeply moving tale and a very inspiring one at that. Even as I write this, the real life Ankita leads a full and complete life, despite her Bipolar Disorder (BPD). In India and China alone more than 10-15 million people have Bipolar disorder. The saddest part is there is no awareness at all about it, in India. 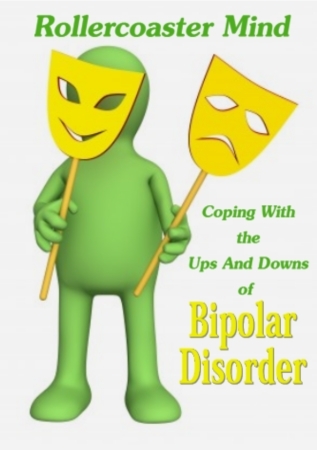 For more information on bipolar disorder and all about it, click here. There is no cure for Bipolar disorder but it can be managed and what is needed is people (family and friends) closest to those having BPD need to be aware about the dos and don'ts (a really useful link worth reading) if someone close to them has it. BPD is also associated with a high degree of creativity. Several celebrities have it (recently Catherine Zeta Jones was admitted to the hospital for it) and it has also ended up taking lives of those who have it. I have spoken about it in my radio indigo interview here. Firstly, congratulations on your second book. I finished reading it yesterday. Liked it. Loved it. One really weird thing happened while I was reading it. I cried. I don’t cry watching movies!!! I didn’t cry watching Titanic or Taare Zameen Par either! (Don’t worry, I am not stone cold :-):-)) .. Just that while I am watching a movie , or reading a book somewhere in the back of my mind I know that all this is not real. But I do not know what happened while I was reading 'Life is what you make it'. Actually, I’ll tell you what happened. I felt Ankita was actually telling me her story. I forgot I was reading a book. What I want to say is that so genuine were the words and the way they were expressed, that it didn’t feel they were words on paper. They felt like the voice of a girl really talking to me. I was so identifying with her in the beginning (especially the part where she says that there is a liberating feeling being in an all girls’ environment .. me being from an all girls’ school myself!) that it felt I already knew her. Somewhere I also realized that if you have made her sound so genuine, then writing her inner most feelings would have definitely taken a toll on you. Did you feel a slight heaviness after you would intensely write the suffering part ? I am sure you must have. But a good good job!! Well, to Varsha and to everyone of you who has read the book, I do want to say that it felt so real, simply because it was! I do feel very grateful about the adulation and love I receive from all of you. Writing is a very solitary occupation and one has to travel to that dark place inside one's own head even when one does not want to go there. Many Congratulations Preeti. It must be truely amazing getting such responses from your readers. I have a smile on my face and I can kind of feel the warmth of your happiness right now :) Cheers! I can almost feel the excitement and the happiness. It is wonderful when you manage that connect with your readers, but then i think that is why many like your writing. Here's to so much more! I remember telling Shail that I was so moved by Life is What you make it that it took me a few days to get my emotions under control so that I could write a balanced and intelligent review on it ! I can very well imagine and understand the emotional toll writing the book must have taken on you. Atfer Blogathon i missed this space badly, now really happy to read a good news, congratulation seems a very little word for me to say here, you deserve more and lot more to come on your way. when this begining gives u encouragement and happiness i dont want to be away from congratulating. many congrats. "Life is what you make it" is a lovely lovely story and we could never forget ankita. Many Congrats... and wish you many more awards and success! And I just missed a chance of being 'Phamous' by being mentioned in ur blog :p !!! Note To self - Chase(Threaten) the IT people in Office to let me access Gmail !!!!! Congratulations! Very happy for your success and wishing you much more. So much more respect for you today: doing things not because they are big or small, but because they are the right thing to do. Real pleasure knowing you. Speaking from the heart. Congratulations Preeti!! Can't wait to get your two books when I'm in India. Look forward to reading them..
Sheila:Thank you :) My books are available all over the world too. Shachi:Thanks a million.You have always been really supportive! Mridula: got your mail! I should have asked you when you pinged. But anyway, post would have become really long had I pblished two letters. Thanks a lot for your encouragement and kind words! Much appreciate. Sundari: Thank you so very much! Eve-O-lution: I do look forward to your letter :-) Thanks! Really, truly happy for you Preeti! Preeti, many many hearty Congrats...and you deserve all of it! The best and the cutest things about you that stand out are your 'feet-on-the-ground' attitude and the 'warmth' in your writing that comes straight from the heart. What seems so natural to you as calling/thanking the person who tweeted you may not appear so natural to many others...and thats where you make a difference. Lovely post!!!! So so SO happy for U Preeti:-))!!!! Wishing U more and more!!!!! Congratulations Preeti. I've to get your books when I come to India. Congrats and glad to see u back. The blogosphere can use your positivity.. too many "dark and bleak" bloggers out there bitching about Indian society all the time. woppiiee.. Congratulations Preeti !!!!!! 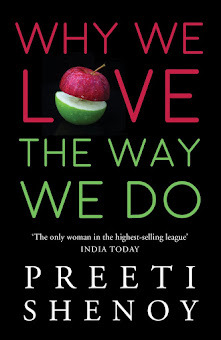 you deserved it..
Congradulations preeti last time i went to shop - odessey i checked for ur book, its not on shelf yet. Will buy a copy soon. Very very Happy for you Preeti. Wish you many more success to come. You deserve all this and more....!!!! There were 25 odd comments when I last checked..I did not delete any! I have no idea why they arent showing! Preeti there was some problem with google. The comments and posts published on the 12thand 13th were deleted. Fortunately I got my post back but not the comment. you deserve every bit of appreciation .. and some more, for all the writing! :) Haven't managed to get a copy yet, and cant wait! Congratulations and all the best for the next one! Many congratulations ! I gifted your book to my Maa on Mothers Day. I haven't read it yet, but I'm sure I'll do it soon.